Discworld Monthly - Soul Music and Wyrd Sisters DVD Box Set. 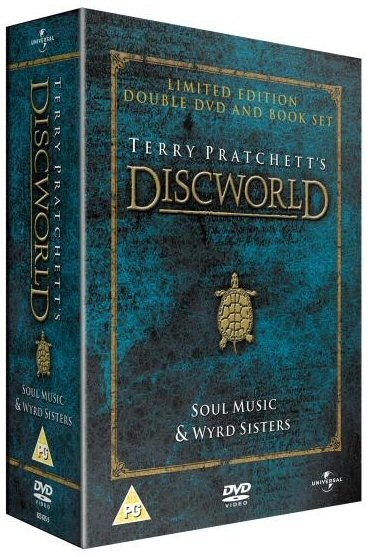 The Discworld DVD Box Set contains full length animations of Wyrd Sisters and Soul Music - acclaimed by Terry Pratchett, they are the only adaptations of the Discworld series ever and a must-have for all fans of Pratchett's work. Also included is the latest Discworld novel, Going Postal - brand new in paperback in Autumn 2005. The all star cast list includes: Christopher Lee, Neil Morrissey, Jane Horrocks, June Whitfield and many more British favourites. There's a weird music taking over the land - it's fast, it's furious and they call it The Music with Rocks in. And what's more, it's alive... Even more sinister, Death has disappeared, but who could possibly be qualified or willing to step into his black cape and wield the scythe? "Extremely faithful to the novel..."
"Pratchett fans should love this..."
But he's got to see that the mail gets through, come rain, hail, sleet, dogs, the Post Office Workers Friendly and Benevolent Society, the evil chairman of the Grand Trunk Semaphore Company, and a midnight killer. Terry Pratchett is one of the best-selling writers of all time. He has sold over 40 million books worldwide. Before JK Rowling, he was the highest earning British author ever (The Times, 1996) and he is the only author to hold No 1 on paperback and hardback charts simultaneously. Awards include OBE 1998, 2000 Bookseller Award, twice Author of the Year and SFX Hall of Fame!